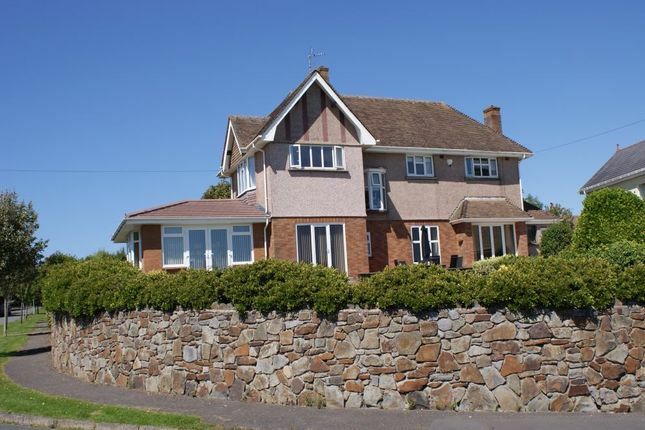 A fabulous setting with sea and headland views from this substantial family residence in Langland. Highbank offers a prospective buyer the perfect opportunity to benefit from an idyllic coastal lifestyle; award winning beaches, breathtaking cliff walks and Mumbles village are all on hand. The well proportioned accommodation offers a high degree of versatility and is ideally set up to accommodate a family with elderly relatives, or teenagers wishing for a degree of independence! There is a main hall with the principal staircase, separate hall with a second staircase, cloakroom, large sitting room with sea views, dining room, 'Mumbles Kitchens' fitted kitchen-breakfast room with an aga, games room-bedroom 5, second kitchen-utility room, principal landing, second landing, four bedrooms and two shower rooms. Externally, there is a gated driveway, triple garage, established lawned gardens and a super swimming pool. A perfect location for an idylic coastal lifestyle. EER= E, EIR= F.
Upvc double glazed, leaded light, double front doors to hall. Staircase to first floor. A mix of hardwood panel and multi pane doors, with brass furniture. Plate rack/shelf. Original brass plate for light switch. Window to rear. Original parquet floor. Low level wc. Pedestal wash hand basin. 29' x 14' 3" minimum 18' maximum (8.84m x 4.34m min 5.49m max) A fabulous, light filled room, with garden and sea views. Large picture window to front and rear. Bay window to side. Feature oriel window to front. Recessed ceiling downlights. Double glazed French doors, leading out onto the rear garden. Open fireplace, with an electric coal effect fire. Wall light points. 22' 3" x 10' 4" (6.78m x 3.15m) Double glazed French doors, leading out onto the rear garden and poolside terrace. Window to rear with sea views. Store cupboard. Picture rail. Upvc double glazed leaded light door, from driveway. Wood effect laminate floor. Second staircase to first floor, with storage under. Glazed wooden door to lounge. 16' 1" x 11' 7" (4.90m x 3.53m) Three windows to front. Stone fireplace, with a cast iron wood burning stove. Beamed ceiling. Plate rack. 17' 4" x 6' 10" (5.28m x 2.08m) Plus door recess. Second kitchen/utility room. Window to side. Sky light. Upvc double glazed door to front. Laminate worktops, with a range of cupboards and drawers under. Matching wall cupboards, with lighting under. Stainless steel single bowl, single drainer sink unit, with mixer tap. Space for fridge/freezer, washing machine and tumble dryer. Built-in stainless steel single electric oven, with a 4 ring electric hob over and an extractor hood above. Ceramic tiled floor. Ceiling spot lights. Part tiled walls. Feature oriel window to rear, with super sea views. Oriel window to front. Second window to front. Beamed ceiling. Hardwood panel doors, with brass furniture. Door to second landing. 18' 1" into wardrobes x 11' (5.51m x 3.35m) A lovely principle bedroom, commanding fabulous sea views, across to Devon on a clear day, from a large window at the rear and a bay window to the side. There is a range of fitted bedroom furniture, to include wardrobes, chest of drawers and bedside cabinets. 13' x 11' to wardrobes (3.96m x 3.35m to wardrobes) Window to side and window to rear, with sea views. Built-in wardrobes, with mirrored doors. 10' 4" x 8' 6" (3.15m x 2.59m) Window to rear with sea views. Fitted wardrobes, with matching headboard and blanket cupboards. Window to side. A recently updated shower room, with a white suite, comprising; a large 'Kohler' wash hand basin. Low level wc. Large walk-in shower cubicle, with a curved glass side screen. Airing cupboard with shelving. Fully tiled walls. Ceramic tiled floor. Access to a very large loft space. Second landing. Two windows to side. Access to a substantial loft area, with huge potential for additional bedrooms, subject to satisfactory planning permission being granted. Bay window to side. Hardwood panel doors. 16' x 12' 1" (4.88m x 3.68m) Three windows to side. Beamed ceiling. Fire recess. Window to front. Low level wc. Large shower cubicle with a glazed door and screen. Ceramic tiled floor. Part tiled walls. Highbank is accessed via a private, gated and stone pillared driveway, off Beaufort Avenue, creating ample parking and leading to the large detached garage. There is an area of lawn, with a secluded patio area and summer house and established trees, plants and shrubs. A walkway leads around to a South facing area of lawn at the rear, enclosed by mature hedging and commanding fabulous sea views. There is a large sun terrace with a low stone retaining wall, immediately to the rear of the property, ideal for relaxing or alfresco dining with a wonderful vista. Steps lead down to a super 30' x 15' swimming pool, and the lawn. 32' x 9' 10" minimum 19' 7" maximum (9.75m x 3.00m min 5.97m max) Large enough to house three cars. Two roller doors. Two windows to front. Window to side. Courtesy door. Power and light. 10' 2" x 6' 9" (3.10m x 2.06m) Low level wc. Pedestal wash hand basin. Quarry tiled floor. Doors to front and rear.